Vocational Service Blends Dry Products for Commercial Bakers with Sanitary Ribbon Blender - Munson Machinery, Inc.
BREVARD, NC  Transylvania Vocational Services (TVS) located in the Blue Ridge Mountains of North Carolina, provides an organized program of developmental activities for individuals 18 years of age or older who have intellectual or physical disabilities. The program includes paid work training to enable individuals who lack work experience or need specific vocational training, to overcome barriers to employment and enter a competitive job market. To fund the program, TVS operates a plant in which bulk food products are blended and packaged for sale to government and commercial customers. The operation can blend a wide range of dry bulk food ingredients, from bakery and confectionary blends to dietary supplements and beverage mixes. These products are blended using a 65 cu ft (1.8 cu m) Model HD-3-1/2-7 SSD Double Ribbon Blender from Munson Machinery Inc. equipped with a shortening extrusion system for bakery mixes. The blender also has a pressurized oil spray bar for adding uniform dosages of vegetable oil. "Because of its versatility and ability to produce a number of different formulations, the blender not only provides our clients with an excellent vocational opportunity but also allows us to market our products to a variety of customers," says Steve Green, TVS Plant Manager. Blended products such as Hot Roll Mix, Sweet Roll Mix and "NutraBlend" Instant Corn Soy Blend are all sold under the Mountain Maid™ trademark. The non-profit organization acquired the trademark as the result of a contest conducted in 2000 in preparation for packaging nonfat dry milk for the United States Department of Agriculture (USDA). The name was selected because it was symbolic of the culture of western North Carolina. One of TVS's newer products is called Mountain Maid Low Fat Bakery Mix, a blend of whole wheat flour, instant nonfat dry milk, shortening and proprietary ingredients. The mix is produced under contract with USDA for distribution to food banks, domestic feeding programs, and other nonprofit organizations. "The ingredients are blended in individual batches in our USDA dairy certified Munson ribbon blender which our clients operate," says Green. "The finished product can be used as a basic ingredient in baked or fried staples such as pie crust, pancakes, doughnuts, cornbread, biscuits and gravy." In addition to Low Fat Bakery Mix and other Mountain Maid branded products, the plant blends custom formulations under contract to customer specifications. "Bakery Mix is prepared in 2500 lb (1134 kg) batches," Green explains. "Two ingredients  1950 lb (884.5 kg) of dry whole wheat flour and 150 lb (68 kg) of instant nonfat dry milk  are pneumatically conveyed into a weighing hopper on load cells located directly above the ribbon blender. 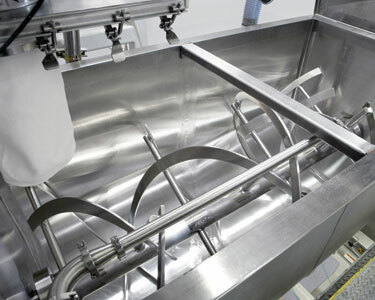 About 250 lb (113.4 kg) of proprietary ingredients are added to the blender by hand, while some 150 lb (68.0 kg) of shortening is added by means of a progressive cavity pump. The pump is equipped with a hopper to hold 50 lb (22.7 kg) blocks of shortening, and the hopper is equipped with a gravity fed screw auger to pull the plasticized shortening into the pump. If the product being blended requires vegetable oil (Instant Corn Soy Blend, for one), the dosage to the blender is regulated by a programmable logic controller interfaced with load cells beneath the oil holding tank. The Munson ribbon blender is a stainless steel food grade unit with a capacity of 65 cu ft (1.84 cu m). Powered by a 25 hp (18.65 kw) electric motor, its 2-to-1 agitator length-to-width ratio yields uniform blends in minimum cycle times. Blending capacity is calculated as approximately 70% to 80% of total vessel volume, leaving ample room for material flow on the upswing side of the agitator. All internal welds have a minimum 0.25 in. (6.35 mm) radius to eliminate corners, cracks and crevices that could entrap material. Tight tolerances of 1/16 in. to 1/32 in. (1.6 mm to 0.8 mm) between the ribbon blades and the blender trough minimize the residual heel of material remaining in vessel after discharge, an advantage when cleaning between batches. Once the Low Fat Bakery Mix is thoroughly blended, it is discharged into a bulk bag located directly below the blender. 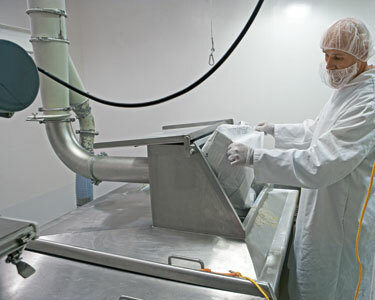 The bag is transported to a separate clean room where its contents are packaged in various smaller containers to fill individual customer orders. 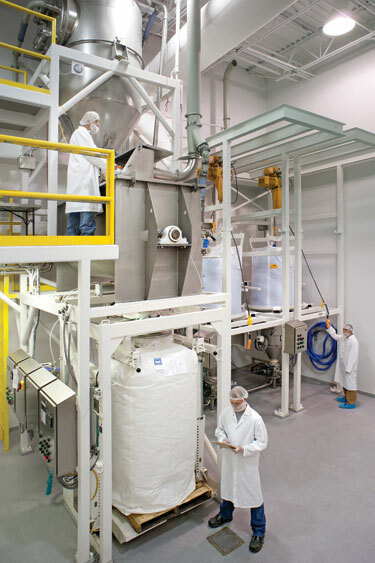 "Our clean rooms can be used interchangeably for any of our blended products, but packaging lines for different food products are located in separate clean rooms, each with its own separate HVAC system to prevent cross-contamination," Green explains. "After each product production/packaging cycle, the clean room is thoroughly sanitized. The sanitation is then verified using ATP testing, a rapid measurement of actively growing microorganisms through detection of Adenosine Triphosphate, or ATP. 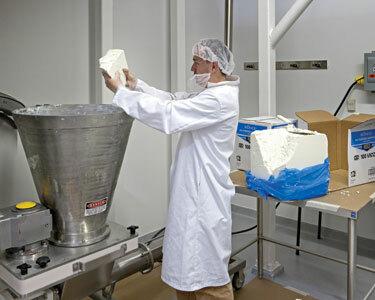 Allergen testing is also conducted before setting up the clean room for the next product. The ribbon blender was purchased with the assistance of Solid Design Southeast (Charlotte, NC), an independent Munson representative. "John Reinecke, our Solid Design sales representative, worked closely with us in selecting the proper equipment," Green recalls. "He helped us locate an engineering company that could design and install the entire production line, including the blender and the accessories required to weigh and measure the Bakery Mix ingredients. Munson personnel were also available whenever we had questions. In fact, we are in the process of purchasing a blender, similar to our current installation, to increase our manufacturing flexibility and to expand our total blending capacity." The TVS food packaging operation is certified to USDA 3-A standards. "Such certification requires inspection by a qualified third party to verify use and maintenance of uniform standards and practices for the sanitary and hygienic design, fabrication, installation and operation of equipment and machinery," Green explains. "As an ISO 9001:2008 registered facility, we assure our customers that quality is integrated into every step in our manufacturing processes." TVS is committed to upholding the highest food safety standards. 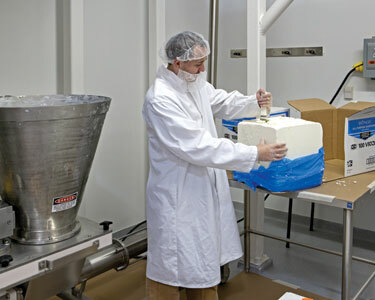 "Our production and sanitation practices, based on the highest industry guidelines and current good manufacturing practices (cGMPs), are put to the test constantly through audits by the USDA Agricultural Marketing Service (USDA-AMS), Food & Drug Administration (FDA), U.S. Army Veterinary Command (VETCOM) and other third-party agencies," says Green. "If a customer needs Kosher certification, we can provide that as well." From each bulk bag, dry whole wheat flour and instant nonfat dry milk are pneumatically conveyed to a weighing hopper and then into the Munson HD-3-1/2-7 SSD Double Ribbon Blender. Shortening is added to blender, equipped with a shortening extrusion system, by means of a progressive cavity pump. Small amounts of proprietary ingredients are added to the blender by hand. 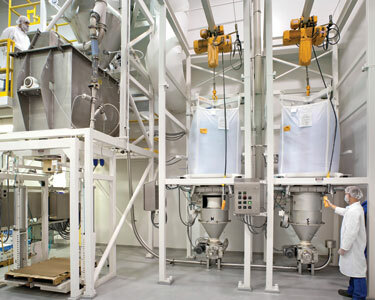 Overall view shows two bulk bag dischargers for whole wheat flour and nonfat dry milk, pneumatic conveying lines, weighing hopper, hand addition of ingredients, the ribbon blender, and final mix in the bulk bag below blender. Designed for thorough mixing, easy cleaning: Tight tolerances between ribbon blades and blender trough minimize residual material remaining in the vessel after discharge. Agitator length-to-width ratio of 2-to-1 yields uniform blends in minimum cycle times. A spray line is included for liquid additions. 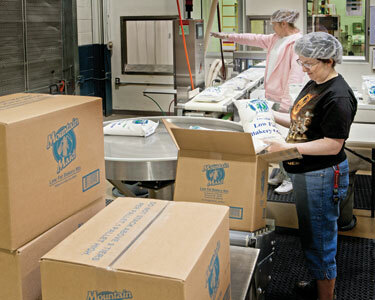 Packages of Low Fat Bakery Mix, among other blended products sold under the Mountain Maid™ trademark, are distributed to food banks, domestic feeding programs, and other nonprofit organizations. 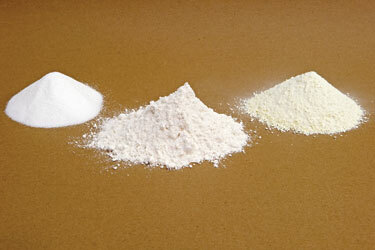 Nonfat dry milk (L), whole wheat flour (R), shortening and proprietary ingredients comprise the final Non Fat Bakery Mix (C).